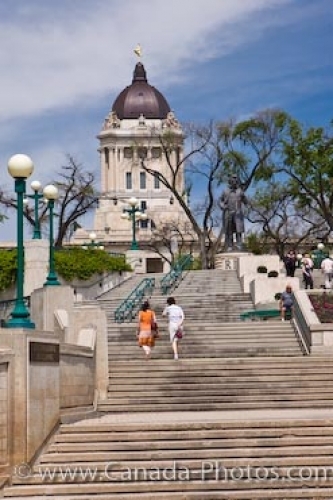 A long flight of stairs on the south grounds of the Legislative Building in the City of Winnipeg, Manitoba leads visitors to the statue of Louis A. Riel which was erected on the plaza in May of 1996. The banisters, seats and lamp posts are painted in a vibrant turquoise hue and the gardens surrounding the Legislative Building are impeccable when in full bloom. In the backdrop, stands the Legislative Building which is situated on 30 acres of land and is designed in a Neo-classical style made of Tyndall stone and Italian marble. Its completion date was in 1919 and on top of the 236 foot dome, a bronze statue named "The Golden Boy" stands 13 feet high. Picture of stairs on the grounds of the Legislative Building in the City of Winnipeg, Manitoba. ... Tours inside the Legislative Building in the City of Winnipeg, Manitoba are available from July 1st to September 7th, but the grounds and the stairs are open to the public all year round. Stairway leading past the statue of Louis A Riel to the Legislative Building and Manitoba Plaza in the City of Winnipeg, Manitoba, Canada.